How safe is your marshmallow? The scariest thing I’ve read lately about the future of America was about marshmallows. In the late ’60s and early ’70s, a Stanford University psychology professor conducted a series of experiments on delayed gratification using 4- to 6-year-olds and marshmallows. 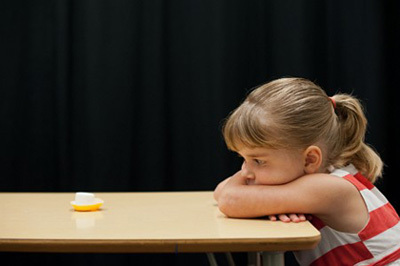 In the experiment, the researcher would give a child a marshmallow and a choice: Eat the marshmallow now, or wait 15-minutes before eating it and get a second marshmallow to enjoy. Fifteen minutes for a 5-year-old with a marshmallow is an eternity. The point of research was to see at what age the ability to delay gratification to receive greater rewards kicked in. Follow-up studies discovered something interesting: Children who were able to delay gratification and get the second marshmallow tended to do better later in the life, scoring better on SATs, getting further in school, having healthier body-mass index scores. The thought was that an increased ability to exercise self-control at a young age led to better outcomes as the child grew. But another study last year called that conclusion into question. Self-control, it turns out, isn’t as important as trust when it comes to delaying gratification. Researchers repeated the marshmallow study, but this time the children were divided into groups: One group had a “reliable” researcher; the other, an “unreliable” researcher. Before the marshmallow study, the children were given used art supplies, but promised that the researcher would return in a bit with newer, better supplies for them to complete a task. In the “unreliable” group, the researcher failed to deliver. Those children, taught not to trust the word of the researcher, were far more likely to eat the first donut without waiting for the second. They waited a mean time of a little over three minutes, while children in the other group averaged a 12-minute delay. That is dangerous because, as we’ve seen, people decide whether to work hard, take initiative, and invest for the future based on whether they trust that it will be rewarded. The kids in the group with an unreliable researcher learned not to trust, so they ate the marshmallow they had instead of delaying gratification and waiting for the second marshmallow. The way things are now, can Americans trust corporate America to give them a promised second marshmallow? Ask Patriot Coal’s retired miners about that. The real question is whether we can trust corporate America not take away the marshmallow we already have. I came across the Priceonomics article on one of my favorite websites, MetaFilter. Just two posts down from that, I saw this article: “The Expendables: How the Temps Who Power Corporate Giants Are Getting Crushed.” The ProPublica article details the rise of the use of temp workers by corporate powerhouses such as Wal-mart, Nike and Frito-Lay. These workers, employed indirectly by some of the most profitable corporations in the world, have no job security, no benefits and low pay. According to Labor Department statistics quoted in the article, nearly one-fifth of overall job growth in the economy since the end of the Great Recession has been in temporary employment. America now has more temporary workers — 2.7 million — than ever. And the conditions they work under are worse than ever. Other low-income workers are being forced to pay fees to get access to their wages, a lucrative arrangement for both banks and employers that can cost workers a significant portion of their already low pay. All these “lazy” people were perfectly willing to work hard, study long hours, and plan for the future, but only when opportunities existed and they trusted that hard work would pay off. This lesson, that people work hard when they are confident that it will pay off, is simple. But it is one that is often eclipsed behind perceptions of culture, innate ability, or other explanations. And this is why marshmallows have me worried about the future of America. As corporations shred decades-old social contracts in pursuit of an ever-better bottom line, as corporate profits soar while the median income of Americans stagnates or declines, as promised retirement benefits vanish and those left with few opportunities for stable employment are derided as “takers,” the trust that hard work can pay off is going to evaporate in the light and heat of available evidence. That trust is the core motivator to work hard, better yourself and work for the future. What happens when a broad swath of America decides such trust is misplaced? Eat your marshmallow now. You know the second one isn’t coming, and you can bet someone in a boardroom somewhere is trying to figure out a way to take a bite out of the first one.